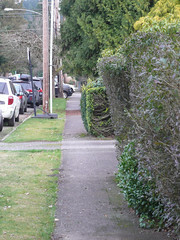 NW Dogwood St is one of only two through streets between Front St N and Newport Way. As such, it sees heavy vehicle usage with relatively high speeds as drivers use it to circumvent traffic delays on other local streets. 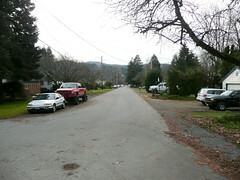 It has a mix of residential densities from single-family dwellings to large apartment complexes. Map. Subarea: Spans Gilman and Old Town. 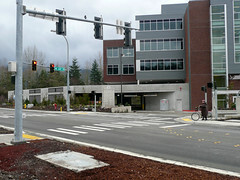 Signage: Pedestrian-triggered signal at Front St (stop sign for cars), Stop sign at Newport Way. Otherwise it’s a clear quarter-mile shot from Front St to Newport. Sidewalks: 38% Both sides from Front St to 1st Ave, then a few semi-random stretches west of there. Bike/ped-only connections: There’s a pedestrian-only trail at the end of 3rd Pl NW which connects through to Holly St. Though it’s mostly blocked by a fallen tree at the moment. Pedestrian crossing signal at Front St that takes forever to change. Green: About midway down there’s a bridge across Issaquah Creek with attendant greenery. 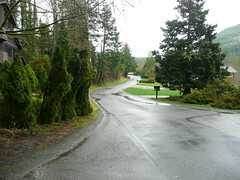 Otherwise, street trees and landscaping. Potential improvements: This street really deserves a full buildout with sidewalks and bike lanes. 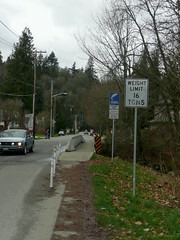 As it is, it’s a street with faster-than-speed-limit traffic and nowhere for pedestrians to walk. On the cheaper side, the pedestrian signal at Front Street should really be more responsive. 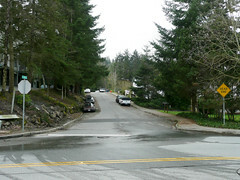 Short dead-end street at the base of Squak Mountain. 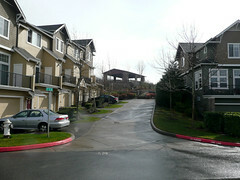 Both sides are lined with apartments and townhouses. Map. Subarea: Gilman. No, that doesn’t make any sense to me either. 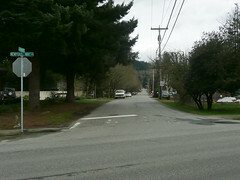 Signage: Stop sign at Wildwood that joins up with the traffic signal at Wildwood and Newport. Sidewalks: 50%. Full length of the north side. Bike lanes: No. Light, slow traffic so little need. 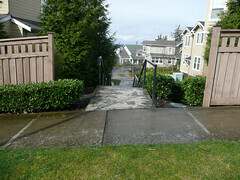 Bike/ped-only connections: There’s a railroad tie staircase into one of the apartment complexes at the end of the road. There are also a couple of muddy game trails leading off into the woods from the end. 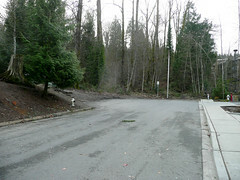 One of the trails seems to connect to an apartment complex off Mountain Park Blvd SW. The other dead ends in a feral teenager nest/trash dump after a few dozen yards. 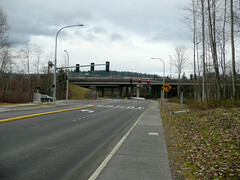 Green: The east end of the street is opposite the Issaquah Creek corridor. 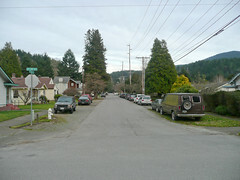 The west end abuts a wooded lower slope of Squak Mountain. 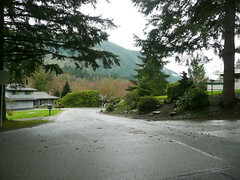 Street trees and nearby Gibson Park. 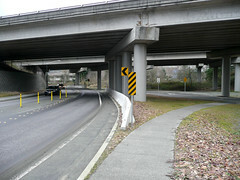 Potential improvements: Formalize the trail to Mountain Park Blvd. Clean out the trash heap on the hillside. 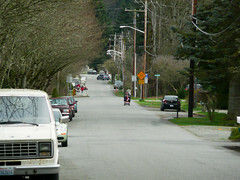 A quiet residential street near downtown. 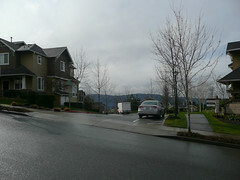 The neighborhood is in transition from single-family homes on large lots to lot-filling duplexes. So density will approximately double over the next several decades. Map. Car lanes: 2. no lines. Grade: Flat. Slopes down slightly east to west. 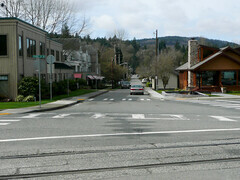 Signage: Two-way stops at 2nd and 3rd. Sidewalks: 58%. 4-foot. Owner-maintained. Varying condition from new on down. Most foot traffic takes the lane. Bike lanes: No. With light, slow traffic, no real need. Amenities: Memorial Field at west end. 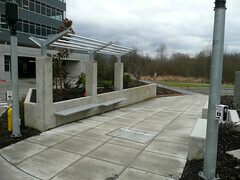 One block to 3rd Ave NE pedestrian bridge. 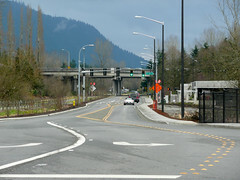 Potential improvements: Good candidate for lowered speed limit when that becomes legal. 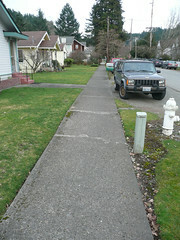 Sidewalks could use improvement, but it’s relatively low priority since it’s mostly safe to walk in the street. Crosswalk between Memorial Field and the north side of the street is in ill repair.